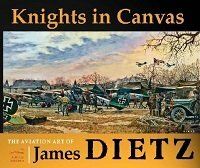 For many years award-winning artist James Dietz has been one of the most esteemed painters of WWI aviation. Now enjoy his striking aviation art collected in one volume! Lavishly illustrated, this book features 74 full-color paintings by Jim that bring WWI aviation to life. More than a dozen respected WWI aviation authors contribute to the story with chapters providing the background for the paintings to increase your understanding and appreciation of Jim's exceptional work. In a well-illustrated chapter, Jim discusses how he creates his art using two recent paintings as examples. With forward by Sir Peter Jackson, renowned producer of the stunning Lord of the Rings trilogy.